By External Relations Posted: April 11, 2019 2:00 p.m. The sheer volume of images from which to choose boggles the mind; however, you can narrow your search by selecting from a dubious set of categories that range from “cheese board” to “armpit”. The options list is based on an algorithm that does not appear to follow any kind of easily detectable alphabetical or hierarchical order, making what seems like it should be a simple search rather daunting, not to mention time consuming. Researchers at the University of Regina have found a way to vastly improve the way images are presented to us when we conduct online searches. Images searches, regardless of platform, function the same: you type in keywords and a grid of images appear. Orland Hoeber, professor of computer science, along with graduate student Manali Gaikwad want to change that. Their research focuses on building interactive image search interfaces, allowing you to search for something on your Instagram Explore page, for example, and see the images sorted by colours or hashtags or how recently they were posted. 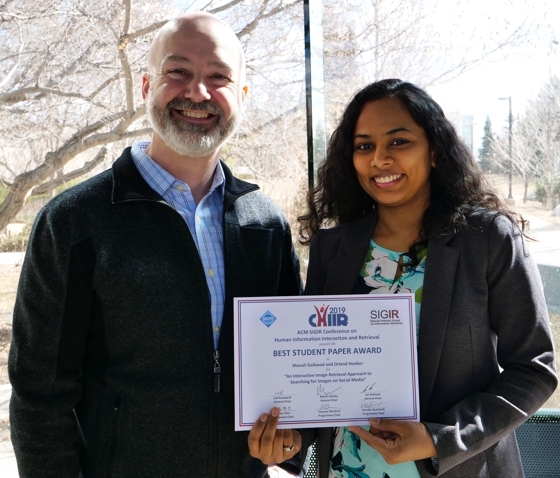 This March, Hoeber and Gaikwad received the Best Student Paper award for "An Interactive Image Retrieval Approach to Searching for Images on Social Media" at the 2019 ACM SIGIR Conference on Human Information Interaction and Retrieval in Glasgow, Scotland. The award and the annual conference carry significant weight within the computer science community. Gaikwad is glad she chose the University of Regina to work on her thesis. “U of R has one of the best faculties that I've ever had access to for learning such a range of topics in the field of data science,” said Gaikwad. After finishing her studies, Gaikwad wants to continue to work in the field of data science, helping businesses better understand their customers. Hoeber, with his graduate students, will continue studying how people conduct image searches in order to develop tools to help them have more effective searches, driving the research from “…the theories and models of information behaviour, with a specific focus on learning more about how multi-stage information seeking processes can be supported with information visualization.